Every now and then a brand pops up that I've not heard of before and I see an item of clothing that catches my eye. It's even better when I find out they stock my size and they carry a plus size range. 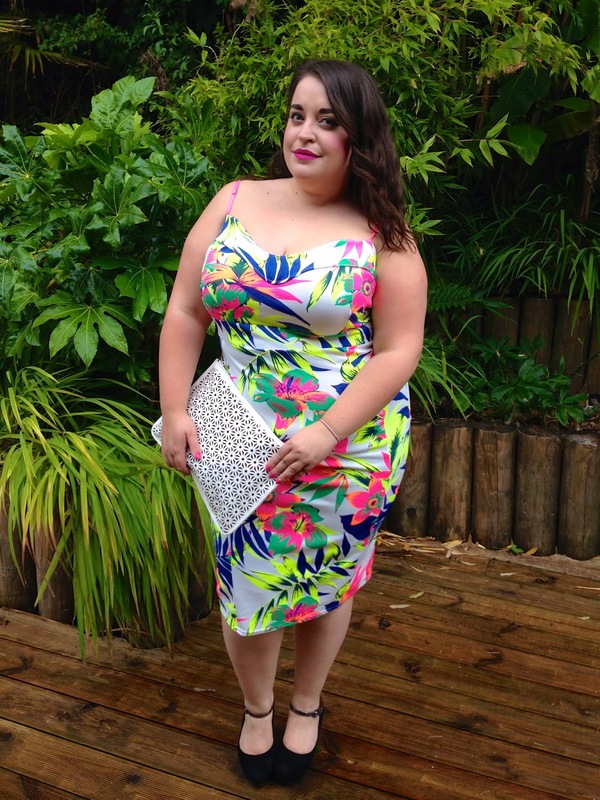 FD Avenue tweeted a picture of this Tropical Floral Print dress and boy did the print jump out at me! It was love at first sight. You must have noticed along the way that I have a thing for printed body cons right? When FD Avenue got in touch with me and offered me the chance to review an item, I was more than happy to say yes and chose this dress. I wasn't sure of their sizing so I sized up considerably and went for the 24-26 although I normally wear a 20; I wanted to make sure it fit. I am happy I did size up as for me, the fit is perfect. It is tight and follows my curves but it isn't too clingy on my belly. (Please note I am not wearing any shape wear in these pictures but in future I will when I wear this dress. I adore the fit of this dress, the subtle sweetheart neckline, the length, the print and the brilliant white base colour of the dress. The one thing that lets this dress down in my opinion is the straps. I like that they are adjustable and that they are neon pink but they are far too thin and flimsy and they feel like a bit of an after thought. The dress is very well priced at £18.99, they regularly do offers and you can also get this dress in a variety of different prints. 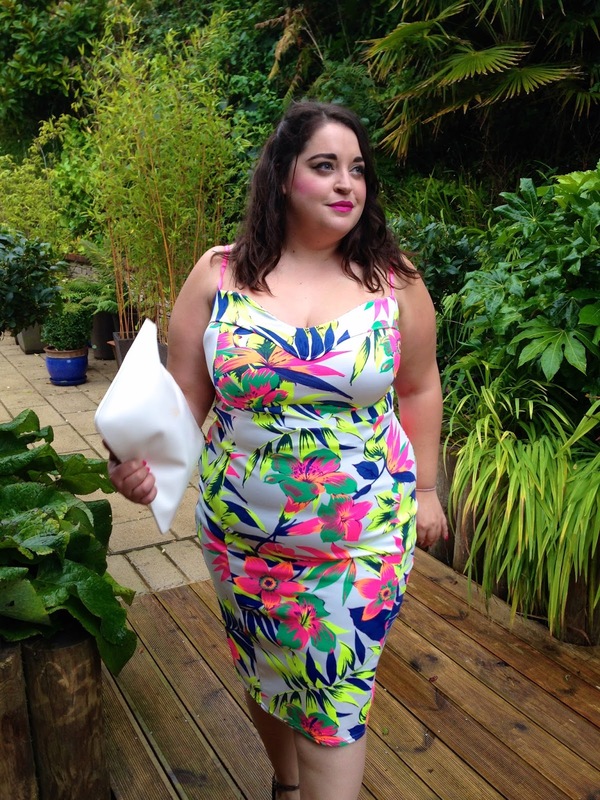 Check out the rest of their 'Curvy' range here. Ooh I'd seen this in smaller sizes, but never knew somewhere was doing plus-size. I really like the turquoise floral print one. I'm a 20 and would definitely need that 24/26, it's a pity because those a 22 and up probably won't fit anything. 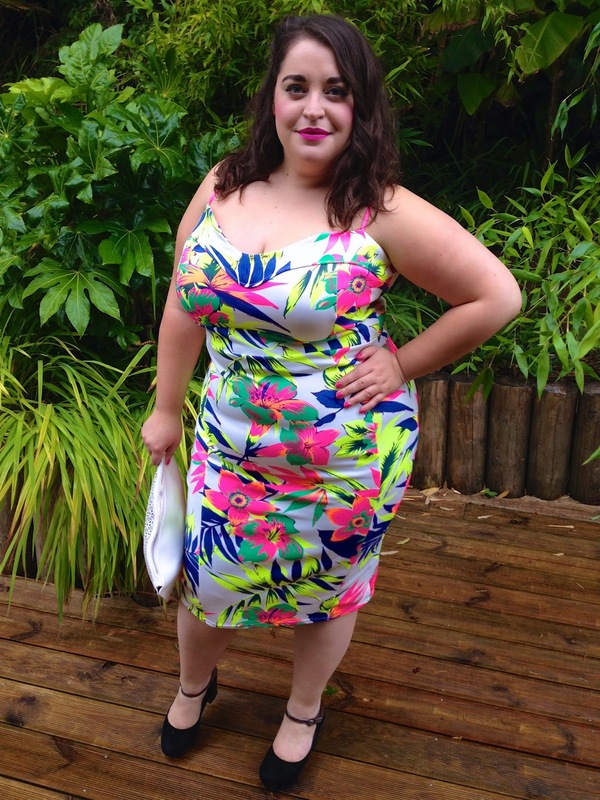 Maybe the less bodycon styles are different.